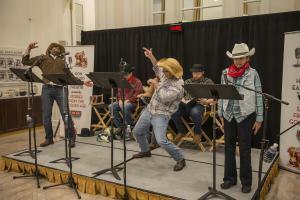 CLEARWATER, FL, US, January 24, 2019 /EINPresswire.com/ — The L. Ron Hubbard East Coast Theatre will deliver an old-time radio-style performance of the western story, Come and Get it, at the Scientology Information Center, on Saturday, February 16th at 6:30 pm. There is no cost to attend and light refreshments will be served. All are welcome. The Center is located at 500 Cleveland Street in downtown Clearwater. Seating is limited. To reserve seats or to learn more about the event, contact Amber Skjelset, Manager of the Scientology Information Center at 727-467-6966 or amber@cos.flag.org.